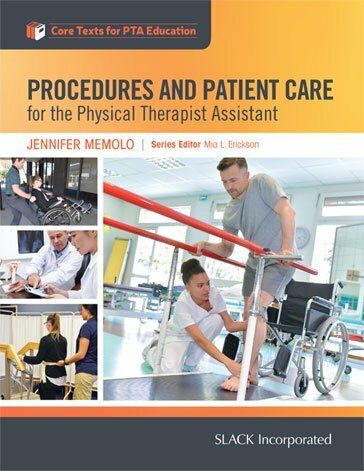 Inside Procedures and Patient Care for the Physical Therapist Assistant, Jennifer Memolo includes objectives, key terms, common abbreviations, and review questions. Also, in each chapter is information adhering to the current best practice and an understanding of red flags a PTA should know and report to supervising physical therapists or other health care providers. This text stands out from others because it is catered specifically to PTA students rather than the generalized health care practitioner. It can be used throughout the student’s education as a reference since all other courses build upon and cycle back to this core information. It can also be utilized even after graduation as preparatory material for the board examination or as a refresher for the practicing clinician. Procedures and Patient Care for the Physical Therapist Assistant provides core information that the PTA will use and build upon throughout their entire career which is what makes it a suitable text for students, faculty, and clinicians. Jennifer Memolo, MA, PTA is from Alabama but currently lives in Omaha, Nebraska, where she teaches in the Physical Therapist Assistant program at Clarkson College. She received her BA in English at Birmingham-Southern College in Birmingham, Alabama, and went on to receive her MA in English/Creative Writing at East Carolina University in Greenville, North Carolina. She received her associate of science in a Physical Therapist Assistant program from Nash Community College in 2008 (Rocky Mount, North Carolina), at which time she moved to Omaha to work in inpatient rehabilitation and acute care. She has also worked in a skilled nursing facility, has served as Rehabilitation Director, and has worked for home health. In addition to teaching in the Physical Therapist Assistant associate of science and bachelor of science programs, she also teaches graduate level writing classes for nursing students at Clarkson College.